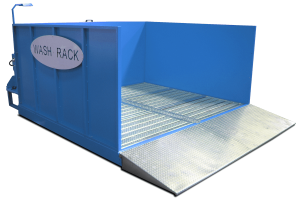 The Wash Rack is a self-contained, environmentally friendly cleaning system for tools, mobile construction plant and equipment. The system provides a simple cleaning solution which prevents soil pollution or accidental contamination of drains from oil, grease and other contaminants. The Wash Rack is an ideal rental product. It can be used at depots (outdoor or indoor) to clean machinery and equipment. 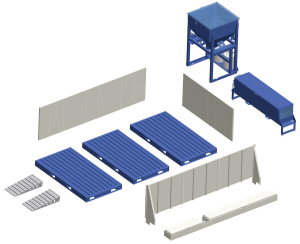 Alternatively, it can be rented out to contractors to be used on site for keeping equipment clean and preventing contamination of soil with minimum water usage. Water is recycled, oil and dirt are filtered and removed to be disposed of correctly. Cleaning equipment means more safety of use for operators and facilitating reparations and after-sales activities of technicians and engineers. An Innovative, Economical & Green Product, the Wash Rack is specifically designed to be an environmentally sustainable product. 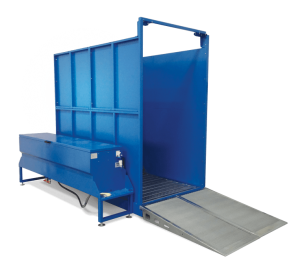 The Wash Rack is an ideal rental product for use at depots (outdoor or indoor) to clean machinery and equipment or for use by contractors who need to keep equipment clean with minimum water usage and prevent run-off contamination.